Happy birthday to my dear friend Jennifer! You've all heard me mention her many times and I often feel grateful that I have such an amazing woman in my life! Jennifer is all sweetness, joy, encouragement, and talent, and I feel lucky to have met her. If you'd like, head on over to Jennifer's new blog (she'll have her own online store opened up soon) and wish her a very happy day! Oh yes! 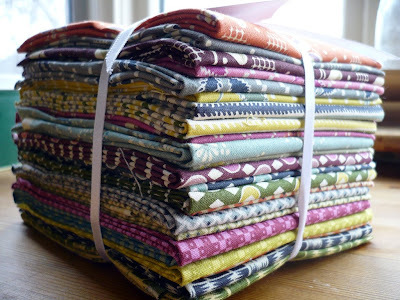 I was persuaded by Alex telling me that I needed to treat myself and Jennifer telling me to "go for it" to finally dive in and buy a fat quarter stack of Denyse Schmidt's new Hope Valley line! Of course, Hope Valley is persuasive enough on its own but I was worried about the money aspect. However, I found it for a great price in Randi's Etsy shop, Fresh Squeezed Fabrics...unfortunately, I think I bought the last stack she has at the great price, but she has other Hope Valley half yard stacks available. This fabric is going to be matched up with the Flea Market Fancy I received from Katy and will be made into a quilt for me (finally); right now I'm thinking either Dresden Plate, log cabin, or string quilt all sashed with Kona Coal. I don't want to cut the fabric up too small since the prints are gorgeous, so a string quilt might be out! Sunday was the first meeting of the Toronto Modern Quilt Guild! We met up at The Workroom for quilt Sunday (last Sunday of every month), and it was so nice to meet a handful of the ladies in our guild. If you're in the Toronto area or if you'd just like to take a peek, check us out! And thank you to Karyn (owner) who has offered us The Workroom on the last Sunday of every month for our guild meetings! The quilt top is Freshcut from Heather Bailey and white cotton and the backing is from the Aunt Grace collection by Marcus Fabrics. It will be available in the shop once it's open (in a few weeks time) and I've already started cutting and piecing the little boy quilt which will also go into the shop. Ohhh, and I have a few more books to share with you! You can see Meet Me at Mike's by Pip Lincolne in the picture from the For the Love of Craft Books post, but I had only received it the day before taking the picture and so hadn't really had the chance to look it over yet. I ordered it from Book Depository because it is no longer available on Amazon and BD has free shipping world wide on every order (yes, every order, amazing I know) and has great prices! The only thing I would say about BD is that their shipping is a little slower than Amazon (but then again I actually live not that far from the Amazon Canada depot, so things should get to me fairly quickly from them). I really like this book so far, although I haven't used it much, but the pictures are awesome and just my style and basically everything looks like something to make. It's also really useful because Pip has a granny square tutorial at the end of the book which I have been referring to every time I have a moment and forget a step! I received Blogging for Bliss by Tara Frey from the lovely Eileen and I'm loving it so far! All of the pictures are gorgeous and the tips given by other bloggers seem like they'd be super-useful! I can't wait to full dive into this one! And last, but not least, is Material Obsession by Sarah Fielke and Kathy Doughty which I picked up yesterday at Indigo. I had another sewing book which I did not like... I won't share what it was (unless you want to know) because I know lots of people like it ...because it was one of those books that just did not explain things and expected you to have a ton of knowledge about complicated techniques before using it. So I took it back, and got this one which is much more my style! I've only looked through it briefly, but I'm already super-inspired! I finally got to use my new KitchenAid mixer lat night and it's awesome! I made the same cookies that I mentioned in the previous post (yes, that's twice in one week, and yes, they are that good! ); I really didn't need to use the mixer for them, but I wanted to test it out and Alex was excited for me to use it. Alex really loves these cookies and ate a bunch of them, although I think it might have been pushing it when I surprised his with an ice cream cookie bar too! We had some mint-chocolate chip ice cream in the freezer, so I slapped it between two cookies, and presented it to him. He loved it, but I think too many cookies made his stomach upset! Alright, I'm off to work on a paper that's due this week and the two assignments I have due next week. Phew! Oh, but before I go I wanted to share this Olympic Mascot Cookie Tutorial with you! I sent it to Erica immediately upon finding it, because if anyone would appreciate these she would! Look at that stack of Hope Valley! I think it's even prettier in person, don't you? Your baby cute is very sweet. I love the backing fabric you chose. oh..that quilt is amazing...sigh...don't you just *love* the book material obsession...definitely a must have! so glad to have found you by way of dionne...good luck on the giveaway! I've looked at Material Obsession at Indigo a few times -- very tempting. I must admit to being intrigued and curious what book it was you took back! Hi Kaye! 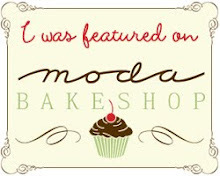 ~ Oh, Jennifer's blog is sweet, I love it! I have a crush on Wilbur! :) and I actually just added Make Something to my faves today! I can't resist a book with a title like Material Obsession...it's calling my name! You are amazing, love what you accomplished in The Workroom. That would take me WEEKS! How cool that you get that space once a month, that owner is a peach! I wanna see pics of the cookies! What flavor? Thanks so much for sharing that delightful shop Kaye! What a FIND! I am lovin' your fat quarters stack too! Drool! Popped in to say hi! 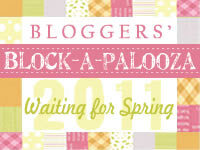 I'm so curious about Blogging for Bliss now...I'm going to check it out! 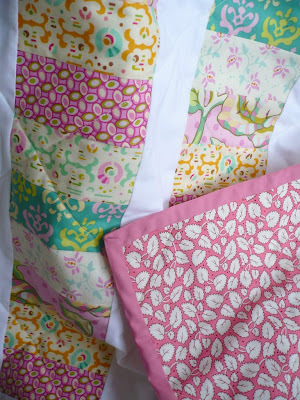 The baby quilt is so pretty and I can't wait to see what you make with the new fabric. oh your quilt is SO cute! i'll definitely have to learn to sew something like that, because i have my first niece or nephew on the way this year! I vote log cabin...that would look fab in all those prints. What fun to make something for YOU! What fabric are you planning to use for your boy quilt? I have a couple to make, and I am torn . . . for my little bruiser I might have to do some bigger boy fabric as he is already 7 months (and 18 month size) so he might look a little out of place with sweet baby fabric (although his crib is still blue toile, he he he). All three books look great! I've met Kathy from Material Obsession and talked on the phone a couple of times. She's amazing - so much energy and passion. I love your stack of Hope Valley. It sounds like its going to be a delicious quilt. Difficult to cut into a stack like that though.